What does Engage Aotearoa do? What is a Cognitive-Behavioural approach? What Can We Do as Whanau or Friends? What do you mean when you say you all have experience of recovery or supporting someone on the journey? 1. 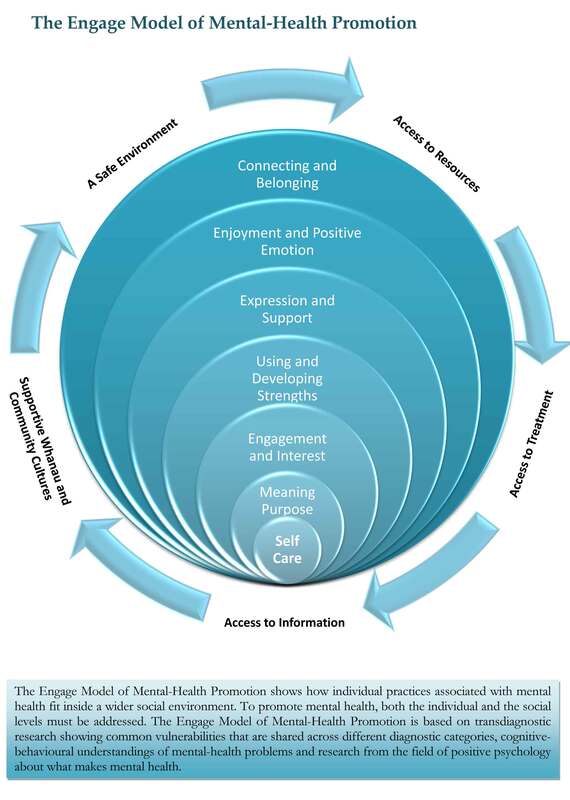 What does Engage Aotearoa do? Engage Aotearoa is a website designed to share recovery tools and resources with individuals in the community. We aim to unite the psychological research with service-user perspectives to make it easier to for people to find what works for them. Our resources and the model that guides us were created by Miriam Larsen-Barr. 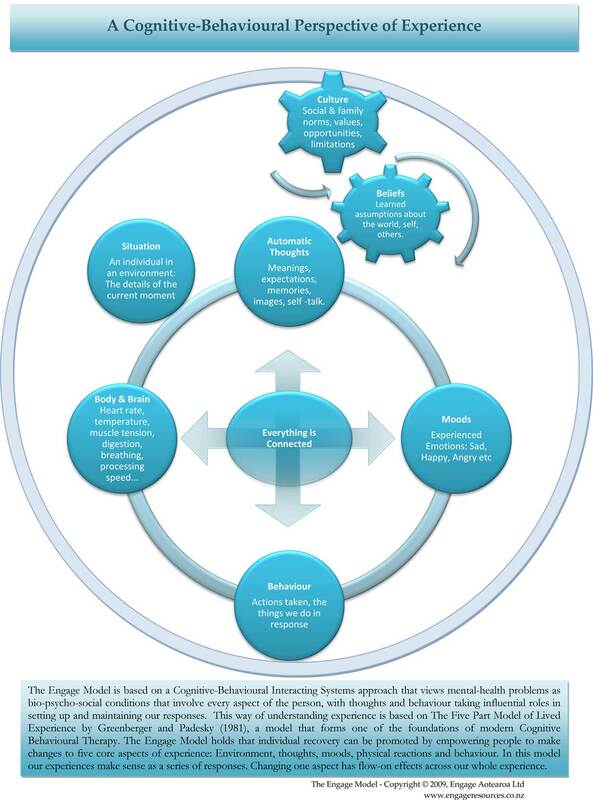 The Engage Model is our way of summarising the research on what is needed to promote recovery. This way of thinking guides our work to connect people with the resources they need to recover from mental-health problems or support someone they know. • We work from our home offices and wherever we are asked to go. 3. What is a cognitive behavioural approach? This approach to understanding people emphasises the reciprocal relationship between cognition (our thoughts) and behaviour (what we do). Further than that, the approach shows how these interact with and are influenced by, our bodies, our environments and our emotions to give rise to our subjective experiences, what we learn about the world and how to survive it. The Coping For Recovery Information Sheet discusses how some of those survival strategies have positive impacts on our wellbeing, but others can harm our mental health. A combination of cognitive therapy and behaviour therapy, cognitive behavioural therapy (CBT) is the most widely recognised, empirically established treatment for just about everything (most of the time). This lends a great deal of weight to the theory and research that underpins it. Engage Aotearoa does not offer CBT. We are informed by the cognitive-behavioural approach; our strategies are based on that understanding, but we do not offer treatments nor do we teach other people to offer treatments. We direct people to effective treatment and we share information. The results of a pilot study of Engage Group showed that simply learning about the cognitive-behavioural approach to understanding human experience and receiving support, helped most people reduce their symptom severity. It didn’t cure anyone, but it helped them along. 4. What does transdiagnostic mean? • Transdiagnostic means across diagnosis. 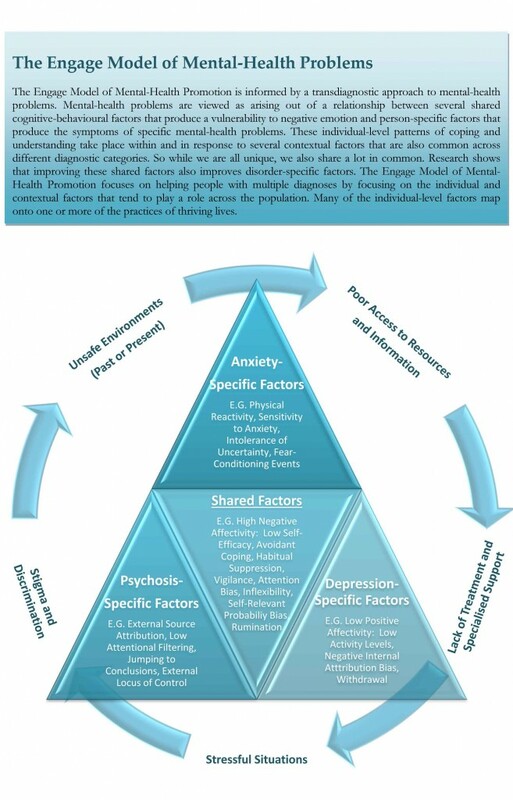 A transdiagnostic approach to psychology focuses on several symptoms and tendencies that appear to be common across multiple diagnostic categories of mental disorder and forms of distress. • It may be that these commonalities form a cluster representing a vulnerability to any disorder, and other factors interact with them to determine the form that the disorder takes, be that depression, bipolar, schizophrenia or an anxiety disorder. • CBT Treatments targeting these commonalities as they relate to anxiety disorders of every kind have reduced anxiety symptoms AND the severity of dual, untargeted diagnoses such as bipolar disorder, depression, eating disorders and some somatoform disorders. This suggests that no matter what diagnosis we have, human beings find a lot of the same things helpful. • We do not conduct these kinds of treatments. We do however apply the same approach to understanding what kinds of information and supports people seeking recovery might need. 5. What is Mental Illness? Download the Mental Illness Info sheet. Recovery is the journey to improved wellbeing for someone who has experience of mental unwellness. It does not mean a return to the days before unwellness – we need to go forward not backwards. Recovery is not about never experiencing unwellness. Recovery means learning from our experiences and actively working towards the kind of life and subjective experience that we want to have; recovery is about learning to give ourselves what we need. Unlike people who have never experienced mental disorder, we need to learn or re-learn skills and new ways of being that promote our resilience to stress and distress. There is more information about recovery in the What Is Recovery? Information Sheet. 7. What Can We Do as Whanau or Friends? Inform yourself about what they’re going through and find out how you can support them. If it is possible, we recommend talking to the person with respect and compassion, and asking them what you can do to understand and help. We also recommend you read the Supporting Recovery Information Sheet on the Information Resources page. If you can hang in there without judgement, you are helping. Use the Community Resources Directory to find ways of informing yourself, getting positive messages about unwellness and finding ways to help your friend or family member forward. If you find yourself feeling frazzled and fed up with it, access some support services yourself. Supporting Families is a wonderful place to start. 8. What is Positive Psychology? Positive Psychology is an approach to the study of human experience that focuses on looking for the ingredients of positive experiences like happiness, wellbeing and resilience, instead of focusing only on problem areas. 9. What do you mean when you say your team all have personal experience of recovery or supporting someone they care about? Our team have all had experience of mental-health problems and are at various stages along the journey towards improving our wellbeing. Some of us still experience periods of unwellness now and then and we continue to use mental-health services when we need them. Some of us take medication as part of our ongoing recovery, some of us have previously taken medication and some of us have never taken medication. We have used different kinds of therapy and support services as well as non-mental-health activities like poetry groups or art classes or employment. So when we say we all have ‘experience of recovery’ we don’t mean that we are all ‘fixed’ and over it now. It means we are learning to live well in the presence or absence of mental-health problems, whatever that looks like for us. Most of us also have family members or friends with mental-health problems who we are key support people for and we acknowledge the different challenges we face when supporting someone else. Our Trust Deed states that board members must have personal experience or experience of being a support person. When someone in our team gets unwell, we take time out from our duties or reduce our duties until we’ve put our self-care strategies into action and feel ready to return to full capacity again. We have an open team and we work together to fill the gaps when someone needs time out or help juggling tasks, knowing the support will be returned should we need it. In this way we try to promote recovery by modelling a way of empowering each other to have the ability to live well in the presence or absence of mental-health problems. We think having team members and board members at different stages of their journey is a strength, because it allows multiple different current perspectives to be incorporated into what we are doing. We don’t have just one agenda or one perspective to push other than access to recovery resources, but it is hard to remember to reflect every angle at all times and our team strongly tends towards holistic bio-psycho-social understandings of mental health. If you feel your recovery perspective isn’t represented or addressed within any of the resources or information on this website, please contact us. We are regularly updating the website and all resources – your perspective is bound to be shared by other visitors to the site. By sharing your feedback with us, we can enrich the Engage Aotearoa website for everyone.